A ULA Atlas V rocket rolled to its Cape Canaveral Launch Pad on Wednesday in preparation for a thunderous nighttime liftoff on Thursday to lift the fourth SBIRS missile-warning satellite into orbit to complete a constellation capable of spotting anything from short-range tactical missiles to tracking the path of Intercontinental Ballistic Missiles. 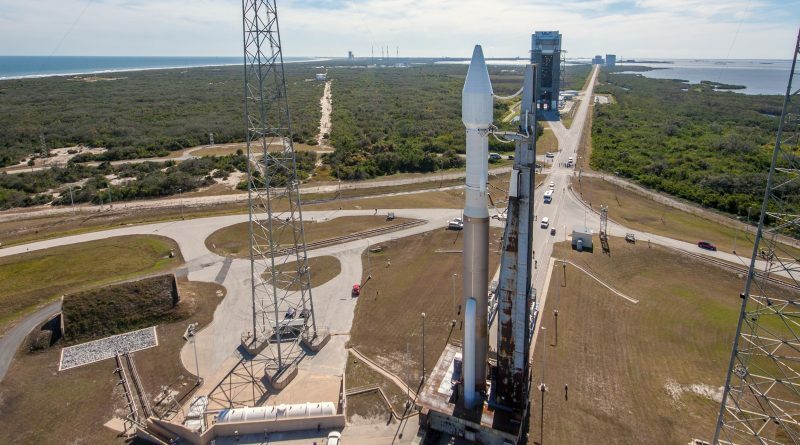 Liftoff is planned during a 40-minute window opening at 0:52 UTC on Friday, 7:52 p.m. local time on Thursday and SBIRS GEO-4 is expected to sail off on its journey 42 minutes after taking flight. SBIRS, the Space-Based Infrared System, is a critical missile-warning asset of the U.S. Air Force, operating several high-altitude surveillance posts to track all types of ballistic missiles across the globe to inform the U.S. and allied forces of inbound threats. 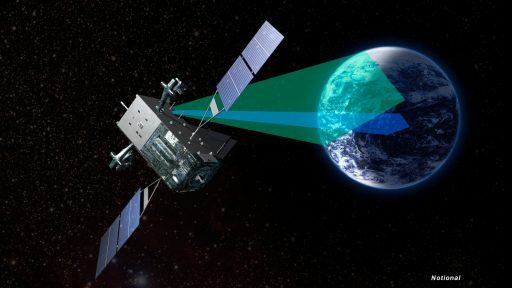 Considered one of the Pentagon’s most critical missions, SBIRS comprises dedicated satellites in Geostationary Orbit – the fourth of which is launching Thursday night – and hosted sensor packages in Highly Elliptical Orbits flying on classified NRO satellites to cover the extreme northern regions. SBIRS was formally initiated in 1996 as a replacement for the Defence Support Program that provided missile early warning capabilities since the early days of the Cold War and was being phased out after nearly four decades of operation. While detection of intercontinental ballistic missiles was the primary objective during the Cold War, today’s changed global playing field also requires detection of the faint signatures of short-range missiles while also watching over the entire planet to detect ICBMs. The first SBIRS Satellite launched in May 2011, SBIRS GEO-2 followed in March 2013 and the third dedicated SBIRS satellite launched in January 2017 after a lengthy delay, including a switch between satellites as the fourth SBIRS production unit launched as GEO-3 while GEO-4 will be flown by SV-3. This avoided pulling SV-3 from storage and putting it through re-testing and simply moving SV-4 into launch operations after its production and testing flow. 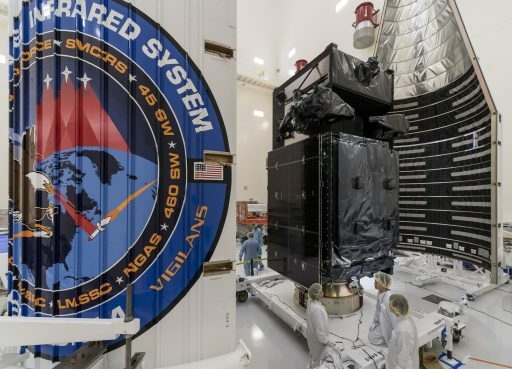 The three SBIRS GEO satellites have taken up station over Africa, the Indian Ocean and the Western Pacific Ocean, covering the entire globe except north America, the western Atlantic, eastern Pacific and the western half of South America. This gap is likely to be filled by the GEO-4 satellite, allowing the final Defence Support Program satellites to be retired once the four-satellite SBIRS constellation can deliver global coverage. 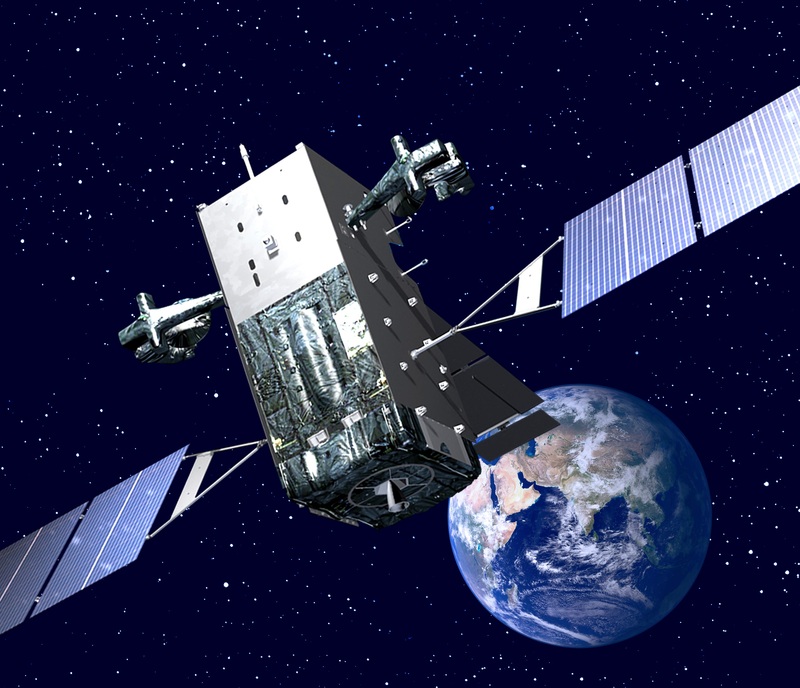 SBIRS GEO-4, coming with a price tag north of $1 billion, is functionally equivalent to the first three SBIRS satellites, built by Lockheed Martin based on the popular A2100 satellite platform utilized for commercial and military communications satellites as well as specialized applications such as SBIRS and GPS. Built for a 12-year design life, the satellites host radiation-hardened RH-32 computers that can be reconfigured in flight and a pair of two-panel solar arrays generate around 3kW of power for the satellite’s various subsystems. The SBIRS instrument payload comprises a scanning and a staring sensor, both sensitive in three infrared bands. The scanning sensor is responsible for collecting global data at a high revisit rate to detect intercontinental ballistic missiles while the staring sensor either keeps focused on a single location of interest or steps between multiple areas to detect the low-signature of short-range missiles that could represent a danger to U.S. troops stationed abroad. The instruments cover short wave, mid wave and see-to-ground spectral bands and, in addition to missiles, can detect wildfires and volcanic eruptions as well as re-entering space debris. Compared to the heritage system, SBIRS cuts in half the time required to detect and track a missile launch, feeding more timely information into the warning network to protect the U.S. homeland, military forces abroad and allied nations. Given the importance of the SBIRS system and its continued operation, the U.S. Air Force ordered SBIRS GEO-5 and 6 for nearly $2 billion in 2014 for launch in the 2020s to extend the program well into the second half of the next decade. The first three SBIRS GEO satellites utilized Atlas V 401 launch vehicles for their boost into Geostationary Transfer Orbit, the basic Atlas V version using a two-stage stack. 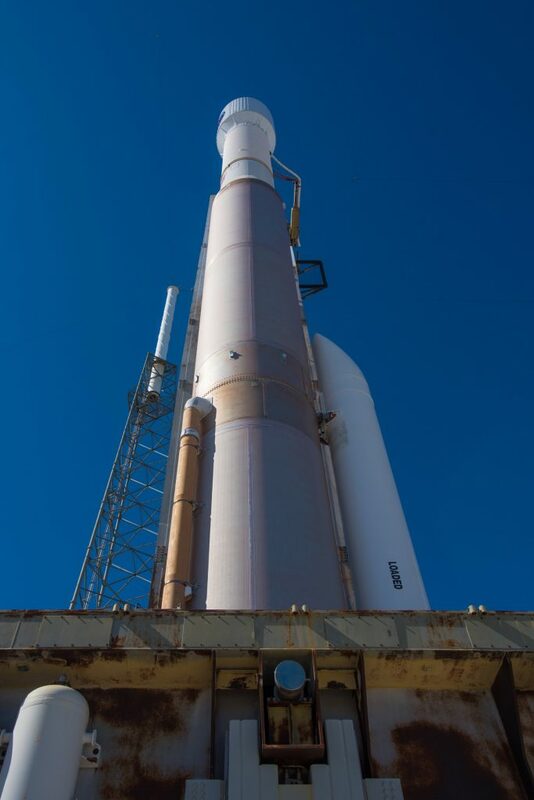 SBIRS GEO-4 on the other hand, will be flying an Atlas V 411 rocket with a single Solid Rocket Booster – one of the “awkward” Atlas V configurations with an uneven number of SRBs that create a visible thrust imbalance as the vehicle climbs out from its pad. The addition of the booster is necessitated by a joint initiative between ULA and the U.S. Air Force demonstrating responsibility in the area of space debris by deorbiting upper stages whenever possible to leave no unnecessary debris in orbit. In case of SBIRS, this means adding one SRB to the Atlas V to gain the required performance for Centaur’s post-separation coast phase and targeted deorbit burn that takes it toward a watery grave in the Pacific Ocean after one lap around the planet. The power of the Solid Rocket Booster not only provides the necessary propellant reserve for the Centaur deorbit but also delivers additional performance that can be utilized on the way up, allowing SBIRS GEO-4 to be delivered closer to its operational orbit by reducing the orbital inclination by an additional 6.4 degrees compared to previous SBIRS missions. The SBIRS GEO-4 launch campaign began on October 31st when the satellite arrived at Cape Canaveral aboard an Air Force C-5 Galaxy aircraft to enter final pre-launch processing operations. 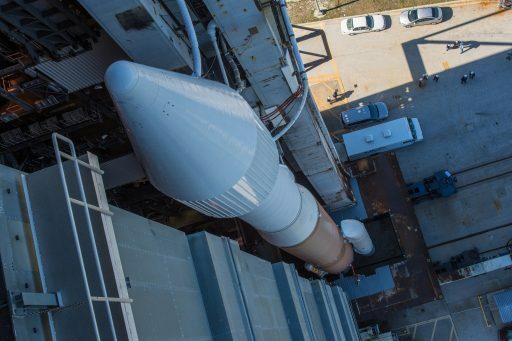 Assembly of the Atlas V rocket started in late December with stacking the Common Core Booster on the Mobile Launch Platform at SLC-41, installing the Centaur upper stage already pre-integrated with its adapters and adding the lone booster to the stack. After SBIRS GEO-4 took its position atop the stack, Atlas V headed into integrated testing activities to clear the way for the Launch Readiness Review, checked off on Tuesday, and rollout to the launch pad, completed on Wednesday. Weather appears favorable for Thursday night’s launch attempt, showing a 90% chance of acceptable conditions with only a small chance of Cumulus Clouds moving in from the Atlantic and causing a weather violation. 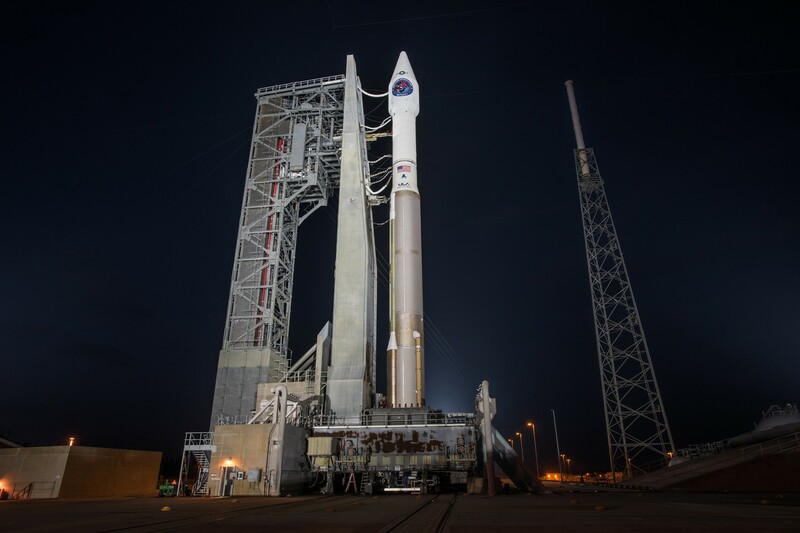 Atlas V enters its lengthy countdown operation seven hours prior to the day’s T-0 target with the activation of the two-stage rocket to then undergo a multi-hour checkout operation to ensure all subsystems are ready to support the mission. At the pad, the first hours of the countdown are dedicated to final physical reconfigurations to button up the launch vehicle and ground facility before engineers depart the complex to enable hazardous operations to commence. Approaching L-4 hours, the Launch Team puts the Atlas V through a series of communication checks on its S- and C-Band Systems and also goes through Flight Termination System testing before applying the purge flow to the vehicle in advance of propellant loading. Coming out of a planned hold at T-2 hours, Atlas V enters the complex procedure to load the two stages with cryogenic propellants. Over the course of an hour and a half, 185,500 liters of Liquid Oxygen will be pumped into the Common Core Booster first stage while the upper stage receives 15,700 liters of the -183°C oxidizer plus 48,100 liters of -253°C Liquid Hydrogen. The first stage receives its dose of Rocket Propellant 1 before the countdown. When clocks reach T-4 Minutes, the countdown enters its second built-in hold for final polling of the launch team prior to pressing into Terminal Count. This hold can be extended in case of technical issues or uncooperative weather, taking advantage of the mission’s 40-minute launch window. At T-2.7 seconds, the massive two-chamber RD-180 main engine of the Common Core Booster ignites and soars up to its full liftoff thrust of 390,250 Kilogram-force. Engine start-up is closely monitored by flight computers to make sure it reaches operational conditions before the launcher is committed to flight by firing up the single SRB and releasing Atlas V from the ground. 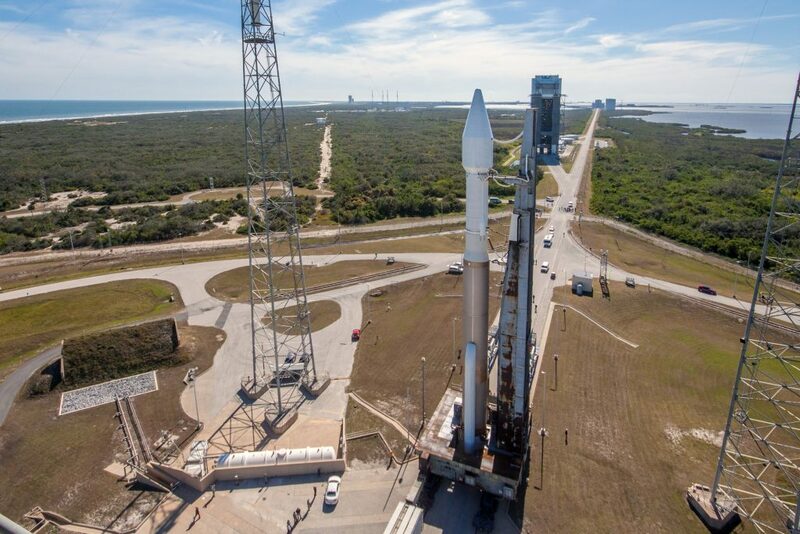 Climbing with a total thrust of 564.5 metric-ton force, Atlas V will rise vertically for just seven seconds before beginning its roll and pitch maneuver to get aligned with its 95.9-degree launch azimuth taking the vehicle to the south east. RD-180 will be in charge of compensating for the off-axis thrust delivered by the lone SRB, making for a fairly strange appearance as Atlas V climbs into the night over Cape Canaveral. Atlas V will pass the speed of sound just 58 seconds after launch followed 13 seconds later by Maximum Dynamic Pressure. Thrust on the lone Aerojet Rocketdyne booster will tail off 94 seconds into the flight when it exhausts its 41,000-Kilogram supply of solid propellant. To ensure the booster makes a clean separation in favorable aerodynamic conditions, Atlas V will hold onto the 17-meter long SRB until T+2 minutes and 20.5 seconds. While the RD-180 continues full steam ahead at a vacuum thrust of 422 metric tons, the Centaur upper stage will prepare for its first ignition by chilling down its RL-10 engine and opening a pyrotechnic valve to initiate the pressurization of the Reaction Control System. Approaching the four-minute mark, RD-180 will begin a gradual throttle back to limit acceleration at the end of the first stage burn. Four minutes and three seconds into the flight, the first stage will shut down its RD-180 engine after burning 284 metric tons of Kerosene and Oxygen. Six seconds after BECO, pyrotechnics will be fired to separate the Common Core Booster that then uses eight small solid rocket motors to move away from the Centaur upper stage. At T+4:19, the RL-10C engine of the Centaur Upper Stage will ignite on its first burn, a planned 9-minute and 30-second firing to deliver the stack into a Low Earth Parking Orbit as part of a standard two-burn GTO mission profile. Ten seconds into the Centaur burn, Atlas V will split open its four-meter payload fairing and jettison the fairing halves to shed no-longer needed weight as aerodynamic forces can no longer harm the satellite once over 100 Kilometers in altitude. Following MECO, Centaur will enter a passive coast phase of 10.5 minutes, required to set up the proper insertion parameters for the rocket’s second burn. While coasting, Centaur maintains a stable orientation as it heads across the Atlantic Ocean to conduct its second burn around the equator to position the high point of the final injection orbit over the equator on the other side of the planet to ease the process of phasing the satellite into its operational Geostationary Orbit. Re-start of the RL-10 engine is planned at T+24:17 and Centaur will fire for five minutes and two seconds, taking advantage of propellant saved during the initial orbit insertion due to the added performance of the booster. This additional performance, beyond what is needed for Centaur’s deorbit burn, will go into the plane change maneuver from a roughly 28-degree Parking Orbit to an inclination of 16.88 degrees. Centaur is tasked with an injection into a 185 by 35,851-Kilometer orbit with propulsive flight expected to conclude 29 minutes and 19 seconds after launch. 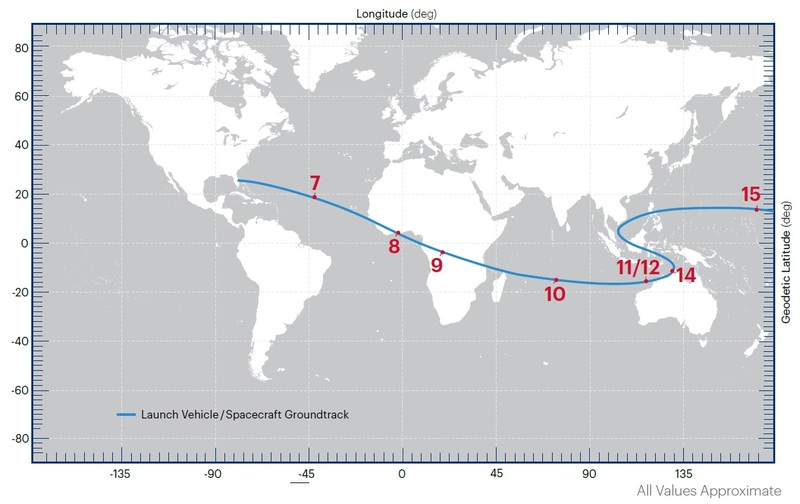 Separation of the SBIRS-GEO 4 satellite is planned at T+42.5 minutes, over the Indian Ocean. Following separation from its launch vehicle, SBIRS-GEO 4 will begin a multi-day sequence with six firings of its main engine to lift itself into Geostationary Orbit, nearly 36,000 Kilometers above the equator where the satellite’s speed matches the Earth’s rotation so that the spacecraft can remain locked over one location. 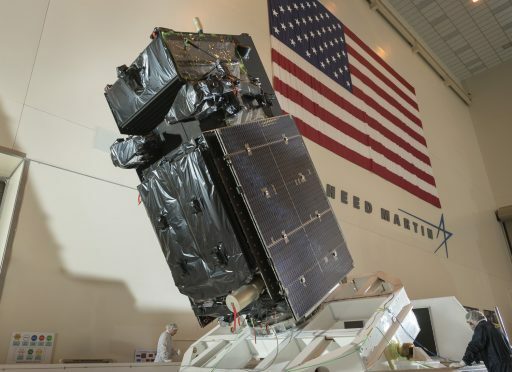 The Air Force did not disclose from where the satellite will operate, but it is fairly certain GEO-4 will take up station to cover the Eastern Pacific and the Americas. 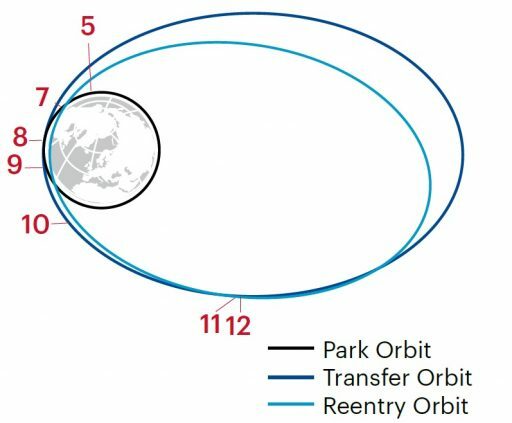 Centaur will complete a ten-second retrograde deorbit maneuver one hour and 14 minutes after launch to sufficiently lower its perigee to intercept the dense atmosphere after one orbit with re-entry occurring over nine hours after launch over a remote stretch of the Pacific Ocean.